Asakusa is a district in Taito Ward of Tokyo, on the banks of Sumida River which is referred to as Shitamachi "Downtown", where an atmosphere of the Tokyo of past decades survives. 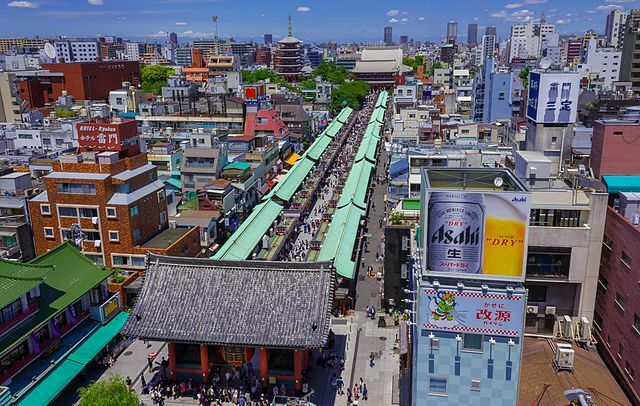 With so many religious establishments, there are frequent Festivals in Asakusa, as each temple or shrine hosts at least one Festival a year, if not every season. Because of its colorful location and relaxed atmosphere by Tokyo standards, Asakusa is a popular accommodation choice for budget travelers. There are traditional Ryokans, homes, and small-scale apartment buildings throughout the district. Asakusa can easily be explored on foot. Kaminarimon "Thunder Gate" is the outer of two large entrance gates that ultimately leads to the Senso-ji, the inner gate being the Hozomon "Treasure House Gate". Four statues are housed in the Kaminarimon. On the front of the gate, the statues of the Shinto gods Fujin "The God of Wind" on the east side, and Raijin "The God of Thunder" on the west side are displayed. Two additional statues stand on the reverse of the gate: the Buddhist god Tenryu on the east, and the goddess Kinryu on the west side. In the center of the Kaminarimon, under the gate, hangs a giant red chochin that is 4 meters tall and weighs 670 kilograms. The front of the lantern displays the gate's name, Kaminarimon. A wooden carving depicting a dragon adorns the bottom of the lantern. Beyond the Kaminarimon is Nakamise-dori with its shops. Nakamise-dori is a shopping street on the approach to the temple. ​The length of the street is approximately 250 meters and contains around 50 shops, providing temple visitors with a variety of local specialties and the usual array of tourist souvenirs. These shops themselves are part of a living tradition of selling to pilgrims who walked to Senso-ji. Nakamise-dori runs perpendicular to the Nakamise Shopping Street. It is followed by the Hozomon which provides the entrance to the inner complex. 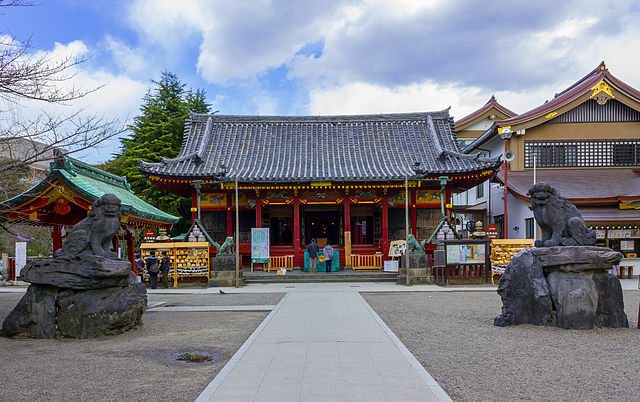 ​Within the precincts stand a stately five-story Pagoda and the main hall, devoted to Kannon. Shin-Nakamise Shopping Street is one of the oldest shopping streets in Tokyo. It is a covered shopping arcade lined by various shops and restaurants. 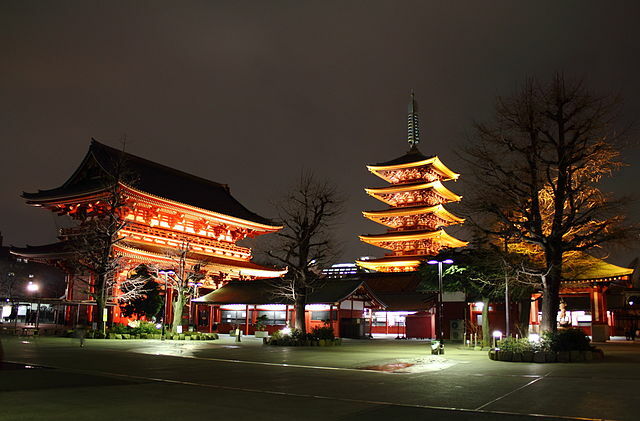 Adjacent to the pagoda is Senso-ji, an ancient Buddhist temple. It is one of Tokyo's oldest temple and also one of its most significant, although the current buildings are postwar reconstructions. 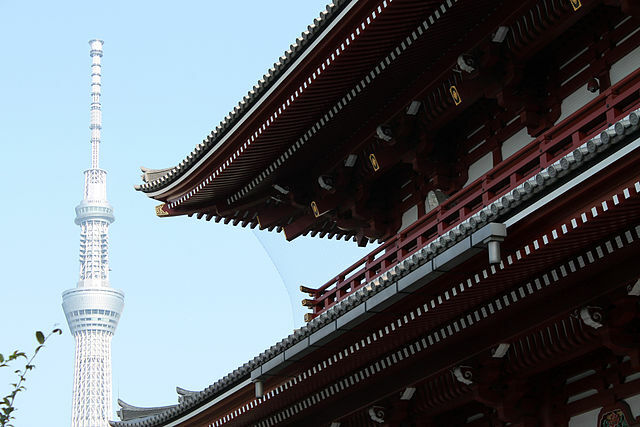 The Sensoji temple is dedicated to Kannon Bosatsu "Bodhisattva of compassion", and is among the most widely visited spiritual site in the world with over 30 million visitors annually. It ranks among the top 10 temples in Japan for the number of visitors in the New Year. 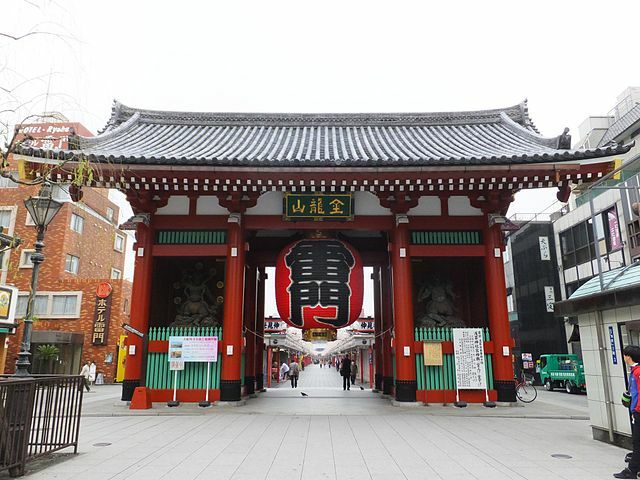 ​Asakusa Shrine known as Sanja-sama "Shrine of the three gods" can be found on the east side of the Senso-ji. The shrine honors the three men who founded the Senso-ji. The shrine's festival, the Sanja Matsuri, is one of Tokyo's most spectacular and popular, which is held on the third Saturday and Sunday every May. Dempoin is a temple just next to Sensoji, which has a beautiful garden of some 12,200 square meters, which is currently not open to the public. Edo Shitamachi Traditional Crafts Museum permanently displays 350 works from 45 different industries. Traditional industries have been popular in the Taito District from old times, and many craftsmen are still engaged in such activities. 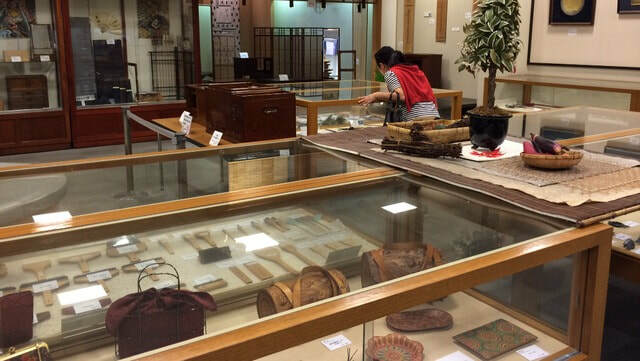 The Museum exhibits traditional hand-made crafts and their reliable skills, and also holds craftsmen’s demonstration of their production activities at weekends. Kappabashi Shopping Street is a street between Ueno and Asakusa which is almost entirely populated with shops supplying the restaurant trade. 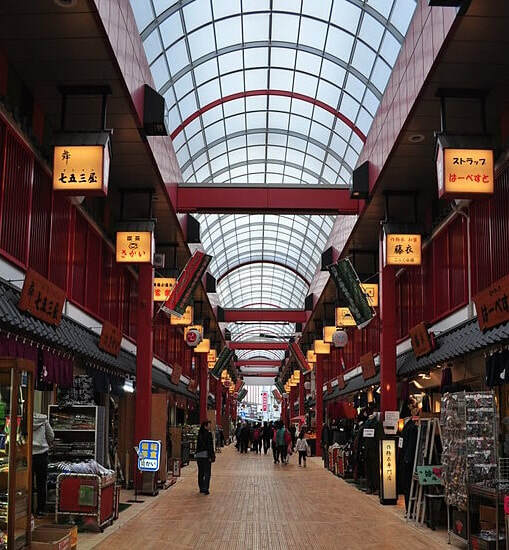 ​With over 170 shops, this is Japan’s largest shopping street selling everything needed by Restaurant operators, with the exception of fresh food. ​These shops sell everything from knives and other kitchen utensils, mass-produced crockery, restaurant furniture, ovens and decorations, through to esoteric items such as the plastic display food found outside Japanese restaurants. 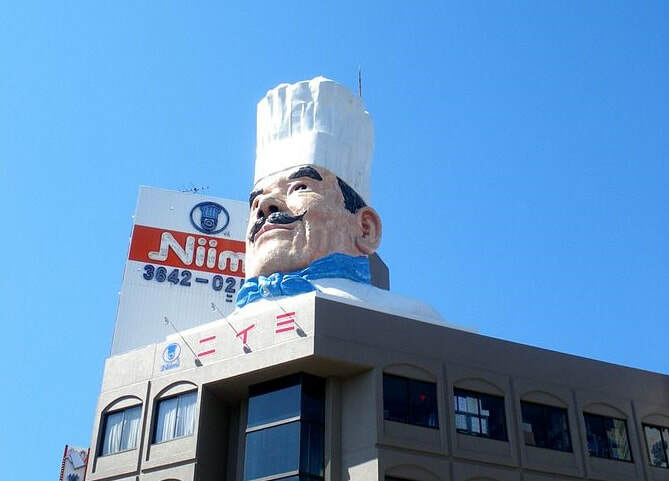 A giant chef marks the entrance to the southern end of Kappabashi Street. The closest station is Tawaramachi Station on the Subway Ginza Line, a short walk away. 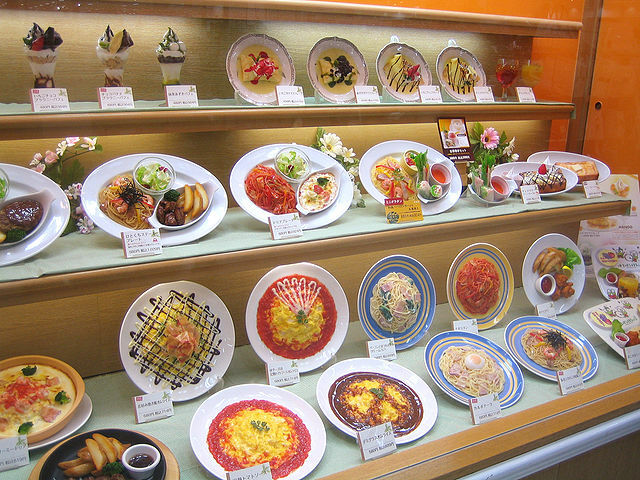 Plastic food replicas appear in the windows and display cases of establishments which serve food throughout Japan. Once made from wax, today they are usually made out of plastic. 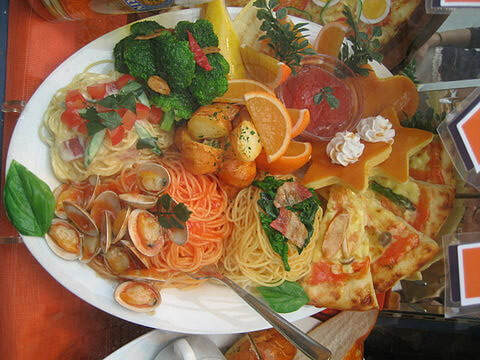 ​Fake food items can be found and purchased in Kappabashi-dori, the food supply street in Tokyo and also at Doguyasuji located in Namba, Osaka. Iwasaki Be-I, the biggest plastic food manufacturer in Japan, has over 80 years of experience in making fake food samples. In recent years it’s branched out into key rings, mobile phone straps …, and now Ganso Shokuhin Sample-ya offers participants a do-it-yourself experience where you try making food samples. For those who cannot read Japanese, the samples offer a lot more information about dishes than a menu could. With their exquisite detail, you know exactly what you’re going to get – what toppings on the ramen, what side dishes with the set meal – and if you really can’t communicate in any other way, all you need to do is point. Asakusa is the terminus of the Metro Ginza line "G19”, which is the best way to get into the area, perhaps by connecting from the Yamanote Line at Ueno Station. From Ueno Station take Ginza Line to Asakusa Station "5 minutes". From Tokyo Station take the JR Yamanote Line to Kanda Station "2 minutes", and transfer to the Ginza Subway Line for Asakusa "10 minutes". From Shinjuku Station take the JR Chuo Line to Kanda Station "10 minutes", and transfer to the Ginza Subway Line for Asakusa "10 minutes". 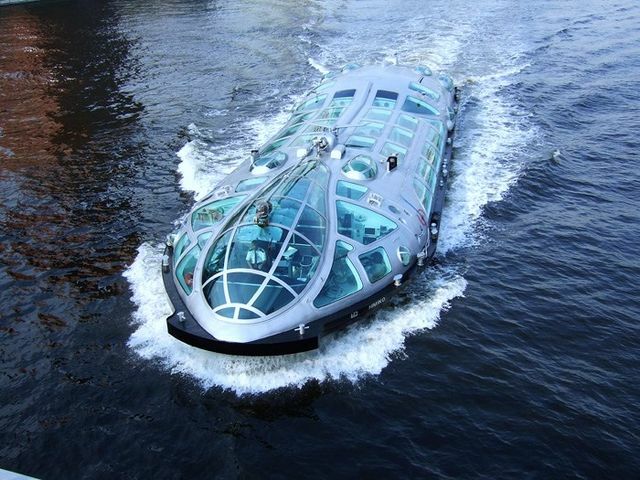 It can also be accessed by the Tokyo Water Bus. 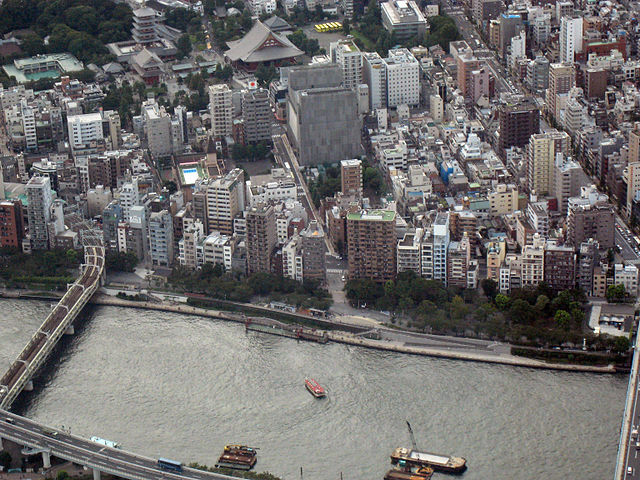 Cruises down the Sumida river depart from a wharf only 5-minute walk from the temple, by the Azuma-bashi bridge. There are a number of boat routes available. Options include services of Tokyo Cruise Ship and a number of the traditional Yakatabuke Ships. ​Tokyo Skytree is twenty minute walk across the Sumida River from Asakusa.